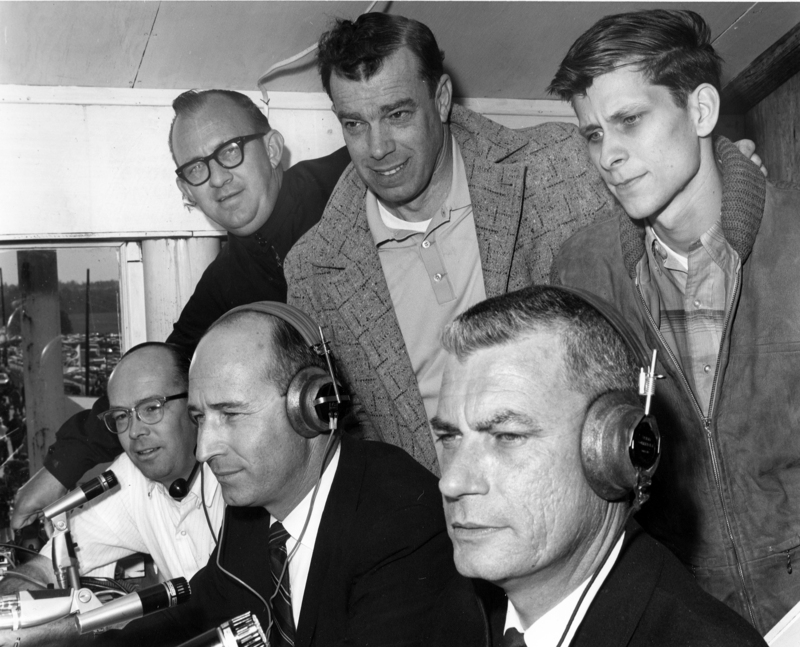 Hank Schoolfield (seated, center) announces a race on the Universal Racing Network. Jerry Perryman is on the left and Bob Montgomery on the right. Standing behind Perryman is Hal Hamrick. Renowned racing publisher, publicist, and broadcaster Hank Schoolfield (1930-2008) donated original recordings of NASCAR races to the Stock Car Racing Collection. The collection of open-reel tapes are radio race broadcasts from the Universal Racing Network, which Schoolfield owned. URN was the first independent radio network to broadcast races. Schoolfield, a native of Reidsville, NC, worked for a number of years as track publicist for North Wilkesboro Speedway and Bowman Gray Stadium. He and Bob Montgomery, a race announcer from Greensboro, NC, formed the Universal Racing Network at a time when the only Sunday races on the radio were local broadcasts of Atlanta, Darlington, and Daytona. "We went from 40-some stations for our first race to over 300," Schoolfield recalled. The tapes cover races from 1964-1982, as well as recordings of the weekly radio show "Southern MotoRacing Round-Up in 1966-1967. CD copies of the race broadcasts are available for listening by visitors to the Stock Car Racing Collection. Ask at the Special Collections service desk on the fourth floor of Belk Library for the broadcasts you wish to hear.